Good news today for parishes in Hertfordshire! 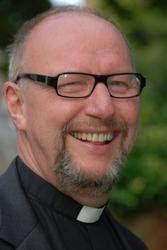 Ten Downing Street has announced that the Revd Canon Paul Bayes, 56, is to be the next Suffragan Bishop of Hertford in the Diocese of St Albans. Canon Bayes will be one of the two Suffragan Bishops in the diocese, assisting the Bishop of St Albans, and his ministry will mainly focus on the parishes and communities of Hertfordshire. He succeeds The Rt Revd Christopher Foster, now Bishop of Portsmouth. “It’s an amazing and slightly scary privilege to be invited to work with Bishop Alan and the team here as Bishop of Hertford. “It'll be great to reconnect with the heart of the church - our local parish churches, schools and congregations. “I have loved my present job working for the two Archbishops. But it’s the priests and people working together in parishes who do the top jobs in the Church. I know the Archbishops would agree with that. Paul brings to his new role over thirty years’ experience in ministry, including over twenty years as a parish priest and five working as a university chaplain. Currently, he is the Church of England’s National Mission and Evangelism Adviser, travelling all over the country, seeking to help the Church make sense of proclaiming the Christian message of God’s self-giving love to rapidly-changing English society. Paul Bayes was born in Bradford, Yorkshire, in 1953. He read Drama at Birmingham University and intended to become a theatre director. However while he was at university a series of encounters, including with two professors of theology, convinced him that God’s love was real and that Christian ministry would be his future. Paul was ordained in 1979 in Newcastle Cathedral. After three years as a curate in the north-east he moved to London for a five-year spell as a university Chaplain. Then it was back to parish life, in High Wycombe for eight years and then in Totton on the edge of the New Forest for ten. In both places Paul aimed for growth in the traditional parish churches in his teams, but he also established new congregations so as to reach new people. In 2004 he began work in London as National Mission and Evangelism Adviser, working with diocesan missioners and others to provide inspiration, encouragement and a ‘can do’ approach to parishes of all traditions and in any setting – urban, rural or metropolitan. He has also been one of the driving forces behind the Church of England’s Weddings Project, which promotes weddings in church as a really positive choice for couples. Research conducted by Confetti.co.uk indicated that 25 per cent of couples who otherwise would not have a church wedding would opt for one if they knew that they could have one. People are serious about weddings and about God, and the ‘Weddings’ team works with local clergy across the country to take that seriousness seriously. Paul is married to Kate, a drama teacher. They have three grown-up children. Kate is a Reader in the church. Following a press conference at the Harlequin Centre in Watford, where the Church is deeply involved with the business, retail and leisure community through the Watford Town Centre Chaplaincy, Paul will spend the day travelling around Hertfordshire. The press conference will begin with a few moments silence remembering the 7/7 London bombings. He and his wife will visit St Andrew’s School, Much Hadham, a Church primary school in rural Hertfordshire, typifying the service of the Church to rural communities over hundreds of years and providing primary education in the nation over two centuries. Their next stop will be to Church Farm,Ardeley run by Roger and Wendy Waygood, both deeply involved with the Church of England in St Albans Diocese. Paul is a lover of new technology and is on Twitter @paulbayes. It is expected that Paul will be ordained bishop on 21st September in St Paul’s Cathedral and be welcomed to the Diocese in a service on Saturday 25th September.